Fila, a leading manufacturer of chemicals for surface care solutions, has seen an increase of over 26 per cent in its sales in 2017, its fifth year of operations in the Middle East region. The company which has been present in the region since 2012 has also established new distribution channels in Saudi Arabia, Oman and Australia, this year. “The past year has been quite exciting for Fila Middle East. Our products have not only been used during the construction phase of the Axiom Headquarters, the Nakheel Mall on Palm Jumeirah and in other mega projects in the Middle East but also in South Asia, particularly in Indonesia and the Philippines,” said Fabrizio Nicoli, commercial director of Fila Industria Chimica Middle East branch. “In terms of sales results, Fila Middle East has seen an increase of over 26 per cent in 2017, its fifth year of activity, compared to the previous year,” he told the Gulf Industry. A market leader in surface care solutions, Fila’s products span from pre-grouting protectors, detergents and sealers, to after-care maintenance and stain removal solutions. They are designed for the treatment of marble, granite, natural stone, porcelain, ceramics, terracotta, agglomerates and concrete. In the Middle East, Fila is present through a technical and commercial branch that was set up six years ago. “This local branch allows us to be in direct contact with our clients and all the stakeholders of the regional construction industry on a daily basis, enabling us to provide real time technical support during the design stage, after the stones/tiles have been installed and for every day maintenance,” said Nicoli. Ever since it started its operations in 1943, all the products developed by Fila have been manufactured in Italy. The headquarters, research and development (R&D) lab and manufacturing plant are all located near Venice, in close proximity with Italy’s leading tile manufacturers and stone quarries. Fila exports its products to over 100 countries globally, through seven commercial branches based in the US, Europe, and the Middle East. Fila’s product range, used on any kind of stone surface and porcelain tile, can be divided into three categories: protective sealers, detergents and finishing products. Fila chemicals include anti-stain sealers, water repellents, and detergent to remove heavy construction dirt, along with detergents, after-care maintenance and stain removal solutions. The products that are in highest demand in the Middle East region are its anti-stain and water-repellent sealers, in particular: PW10 back sealer, MP90 EcoPlus anti stain sealer and Hydrorep. In fact, Hydroprep, which is used to provide water protection for façade has been used in the Louvre Abu Dhabi Museum and in the new Presidential Palace in Abu Dhabi. These top-selling products together accounted for around 70 per cent of its total sales revenues in 2017 and 2018 for the Middle East, Nicoli said. Highlighting Fila products’ unique selling points, Nicoli said that their price per sq m is the lowest in the market, considering the period of time during which they are efficient on the stones. “Other key points which are as important in the market are the fact that once applied they do not alter the natural look of the stone, they do not change its glossy or friction value -meaning that they do not make the surface slippery, and last but not least, they are UV-resistant,” he pointed out. 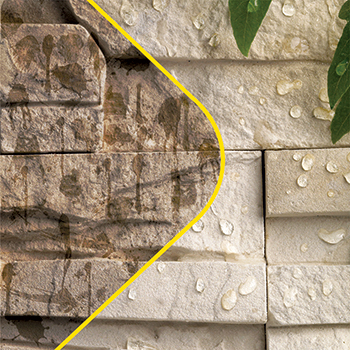 “This last characteristic is essential for outdoor surfaces in the region, where the sun rays are extremely harsh: UV resistance means the natural look of the stone will not be modified in time since it will not turn yellow or lose its colouration. Our pre-treatment solutions and sealers also offer the longest durability in the market,” Nicoli added. Fila’s latest product innovation is Filamarble Aid, an anti-acid product for marble and natural stone surfaces that has also won the “best of innovation 2018” award from the International Surface Event, Stonexpo Marmomac. The odourless, solvent-free treatment protects against the damaging effects of acids, alkaline cleaners and stains; and creates a natural-look polished barrier for stone, marble, limestone and travertine that won’t yellow, discolour or create an ‘acrylic’ look. 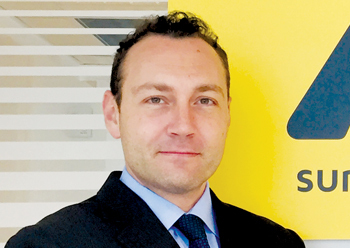 In terms of the growth of its chemicals business over the next three years in the region, Fila is quite optimistic and foresees important potential, based on multiple macroeconomic factors. Firstly, the company is expecting an increase in demand for its products with the approaching of Expo 2020 and the consequent completion of major construction projects. “As many of Fila’s products are used after the floor/surface has been laid, we are expecting an increase in demand in the coming years,” Nicoli said. Secondly, the growing trend to use the type of products Fila has been developing for years now: VOC-free, LEED certified green anti-stain and water-repellent sealers to be in line with Green Building requirements and Estidama. Thirdly, the rise of the price of crude oil, that is enabling regional governments to increase their budget expenditures. “Our focus for the near future will be to put more emphasis on the unique technical support we provide to the stakeholders of the industry, starting from the analysis of the stones treated towards untreated, to providing an international legal economic warranty to guarantee the performance of the products supplied,” said Nicoli. The company has been associated with a number of prestigious and demanding projects. In 2017, the major projects that made use of its products in the region were Nakheel Mall on Palm Jumeirah and Axiom headquarters in Dubai, UAE. To protect the mall’s granite floor and external floor, Fila provided FILAW68, its green anti-stain protector for unpolished surfaces. For the Axiom Headquarters, Fila protected its basalt stone with Hydrorep and Filafob -a stain-proofing agent for unpolished surfaces. Meanwhile, braving challenges, Fila Middle East is continuing to pursue its expansion. “The main challenge we are facing in the region at the moment is linked to the bad reputation sealer providers tend to have because of some cheap, ineffective products that mislead architects, consultants and contractors by promising protection they cannot offer,” Nicoli said. “In order to overcome this challenge, we will keep on developing high quality and efficient products to restore trust in chemical products,” he added.